Just warning you: this post may look like a mile long, so get a cup of coffee or tea and get comfy. I love to babble about products, but today I'm trying to keep things brief. There is a quite a good selection of skincare, somewhat dominated by clean/eco brands. PR samples have a * next to them. If you have further questions about any product, don't hesitate to reach me in the comments section! Enjoy! I'm a fan of Nuori's concept and products, not to forget their beautiful graphic design. This cream was very nice, but perhaps a bit too light for the driest skin types during Winter. I wish they had a heavier version of this as my skin sometimes was left a bit tight. I will probably purchase this again some point during the warmer months. My favorite facial cream of all time. Very liquid-y, but hydrating, nourishing and great packaging; you'll get every single drop out of this pump bottle. I have been gifted this, repurchased myself multiple times, lost a track how many I've used up. While I liked Nuori's cream, January Labs is hard to beat. Another holy grail favorite of mine, but Innisfree recently reformulated this sunscreen. It used to disappear effortlessly into my skin with no major white cast, I've used this for years and over 10 tubes. The reformulation I'm using atm is heavier, a bit tinted, but not tinted enough to cancel the white cast if you won't blend it in very carefully. Will keep using it for now, but might switch to Goodal. Another excellent sunscreen, but this is a light lotion that literally sinks into your skin with no white cast. A little scented, but doesn't irritate my skin. My partner dislikes putting creams on his face, but I've converted him using Goodal. Great for people who hate applying sunscreen, but recently I had hard time finding the essence version. I liked this product, but I wish I had loved it more. It was a good hyaluronic acid serum, definitely recommending for normal to oilier skin types, but if your skin is super thirsty like mine you go through this in an instant. Lovely, but I just wish it packed a little more punch. Good price, will consider repurchasing. My favorite essence to date, has beaten the cult FTE by SK-II in my book. My second or third bottle, will pick up a new one as soon as possible (unfortunately not sold in my country). It doesn't do magic, but the texture is perfect for me and the hydration it gives feels long-lasting. One of my favorite cleansing balms and I've used and loved many. To be honest, I'm not into all the Hungarian thermal water related marketing talk Omorovicza is famous for. In this balm the Hungarian Moor Mud is the 5th ingredient and I wonder how much the minerals have benefit for your skin as you rinse this off right away. However, this balm feels luxurious and pleasant to use, I really loved to massage and remove it with a hot cloth. Will repurchase at some point, I already have a mini size at hand. While Clinique's balm isn't as oil and luxurious as the Omorovicza, this balm is a great and easy-to-access workhorse. If you are drawn to the brand, I'm sure you'd enjoy it. This is the type of balm I like to use for 1st cleanse as it removes makeup in an instant and can be rinsed off with water. Good one to check out. My favorite recent cleansing balm. This balm is a bit more "gritty" and sometimes you can see some of the oil separating a bit, which I personally liked. It wonderfully melts between your fingers, taking off all makeup - even my persistent Japanese waterproof mascara. Great for both 1st and 2nd cleanse, never left my skin feeling tight afterwards. A generous tub, good ingredients (if you're not sensitive to some of the fragrance such as geraniol) and the price isn't bad. Will repurchase! Rituals makes my favorite shower products, difficult to get in Finland, but worth of picking up during trips. Their shower oil is my favorite for washing and shaving, leaves my skin smooth vs dry and itchy. I know L'occitane has popular shower oil, but the prices scare me. The scent of Yogi Delight was OK, might pick up a different 'flavour' next time. It's a water spray. Water. Will not repurchase. I think I will mourn running out of this oil forever. Or, until I get through a couple of other oils and I can allow myself to repurchase this. Despite loving skincare, I rarely actively crave for a specific product. But this oil serum I literally miss and crave, even when I don't have any I wish I did. It gave an instant glow to my skin and I enjoyed it tremendously, plus the scent stole my heart. Read full review here. Here's one of 1st world beauty problems: which Max and Me facial oil do I prefer? I Am The Light or Enchanted (review here)? Well, um, I refuse to decide and use both. Not very helpful, I know, sorry. If you're pondering between the two: let your heart decide, they're both lovely. This small bottle was a PR gift from the lovely Max and Me team, but I already have a full-size I Am the Light in my cabinet. I'm completely smitten with this brand, I can't bear the thought of being without their oils any more. Oddly, Purity and Grace is the Max and Me product I'm not crazy in love with. And by crazy in love I mean I enjoyed it a lot, but I'm not ready to tie the knot and get buried with it. While the oil is nourishing, calming, pampering and perfect for relaxing and mini-facials with a massage, there's something woody about the scent that doesn't spark the same way their other oils do. Don't get me wrong, this is just a personal preference. If you are drawn to more earthy scents, this oil is pure luxe. I will probably repurchase at some point, but right now I'm testing something else. I wrote a positive review of this oil earlier, Aurelia was my "gateway drug" to beautiful, luxurious eco facial oils. You do get a lot of oil for the (hefty) price, which is nice, but I've started to prefer smaller bottles with eco oils. I grew tired of the scent of the Aurelia Night Repair Oil, but if you love lavender you might love this. I personally don't care for lavender so I ended up using this is a body oil. Full updated review here. As much as I love Heroine Make mascaras, I think I won't purchase the waterproof one. I did like how waterproof it was and I got it easily off with my cleansing oil, but the cone shaped wan wasn't for my liking and I poked my lids with the mascara all the time. Will keep repurchasing the film-type version of Volume and Curl. Otherwise, a very nice mascara (although it doesn't give a ton of volume, despite what the name suggests). I have a love-and-hate relationship with this foundation. The color match, wear-time, finish and everything was perfect. The light beige compact is super elegant and I loved every aspect of using this foundie - except it lasted me for only a couple of months, which I does not enrage me as much as they don't sell refills here where I live. And it's over €70/$~86 usd. Too much for too little product. I've heard they do sell refills at least in Singapore, I wonder if somewhere else as well? If I'd ever come across a refill I'd buy it in a heartbeat. My favorite top coat! I wear mostly Essie polishes and this one dries quick and extends the wear of my nail polish. What else you need? Lasted pretty long before starting to turn goopy. Already repurchased. This product used to be my Holy Grail of eye primers as the NARS one was more expensive and hard to get, but I've "grown out" or simply got tired of Too Faced and their branding. I haven't used this one in a long while, so I'm purging it. Phew! Next time I'll try to do my empties earlier. After typing this post I just finished couple ofter products, but they will be seen next time. What's the latest product you finished? Do you agree/disagree with my list here? Lately I've been so intrigued by green beauty, I can't help it. I was kindly invited by Naturelle.fi shop to the launch of new product by NUORI cosmetics where I had an amazing chance to meet Jasmi, the founder of NUORI cosmetics, and have a quick chat with her. Jasmi is born in Finland, but lived more than a decade in Denmark where she got the idea for fresh cosmetics brand and founded NUORI (Finnish for 'young'). I talking to her was such a pleasure as she is so passionate, open, knowledgeable and overall lovely person. Today I have NUORI's newest launch, the Vital Unifier all-in-one face mist for review, enjoy! NUORI certainly has an interesting history: as Jasmi used to be L'oreal's marketing manager. In 2010 EU started a law in cosmetic labelling, requiring a best before date for cosmetics unless the manufacturer guarantees stability of 30 months. To my understanding, then you need no such label. To Jasmi growing sizes of cosmetic bottles, cheap ingredients and added stabilizers was crazy, so she founded her own brand about two years ago. NUORI strives to product fresh cosmetics - they a "start using by" date! This means the retailers are not allowed to sell the products afterwards. I think this is the first cosmetic brand doing such labelling. After opening, the customer has a good 3 months (minimum) to use up their product. According to Jasmi, their product formulas have proven to be more than long-lasting (in their lab), but she still wants to provide as fresh products as possible - making a new patch in every 10 to 12 weeks. The NUORI skincare is all made in their lab one hour from Copenhagen, where they even have own spring for water. Although NUORI translates as 'young' in Finnish, the name comes from added efficacy and purity, which is depicted in the yellow-white packaging. This product is designed to be toner, essence and mist all-in-one. 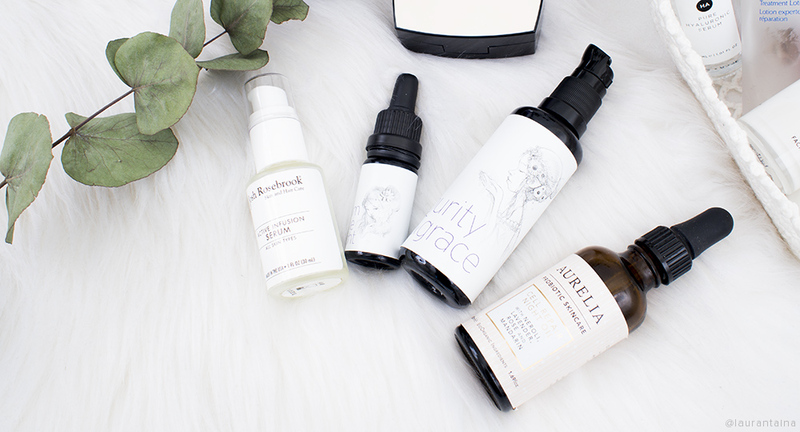 According to NUORI's website you can use the Vital Unifier as your last step in cleansing routine, enhance the efficacy of serums/oils/next skincare steps, hydrating mist and as a makeup refreshing spray. Vital Unifier comes in a 100ml opaque spray bottle, costing 42€/ ~$48.90. A steep price for a mist, but not for high end toner or essence. I probably haven't mentioned but I used to study Graphic Design focused on print media, layout and package design before moving to digital media. Every time there's innovative packaging with beautiful typography I feel like jumping with excitement. Sure any fancy foiled letters and colors are cool, but I honestly prefer Scandinavian chic, efficient and well-thought out style. You open the package either from its side or traditionally from the top. If you place several packages together, they form a nice aligned line. The yellow stands for the "efficacy" and white for "purity". The mist itself comes in an opaque white plastic bottle with very minimal writing. I often mistake the bottle for glass as it feels luxuriously substantial and the cap is very secure. There's some weight to the bottle, but I would still feel comfortable carrying the mist around in my purse if needed. To be completely honest, I'm not a big fan of face mists in general: I much prefer using my hands to tap any essence on my face or using MUJI peelable cotton pads for a toner. Still, I feel like Vital Unifier has won me over. I use it AM or PM after cleansing to gently mist my face, sometimes after exfoliating toner. There's instant feel of light hydration, which I like to seal in with a serum or a facial oil. I think this mist would be suitable for all skin types as there is no feeling tackiness or residue on the skin. The mister itself is very good, a fine cloud that's slightly wet - just slightly, I haven't experienced any droplets on my face while using it. The mist feels refreshing and comfortable on the skin. I find Josh Rosebrook's face mister even finer, but I end up spraying it a lot more to get the same notable feel on my skin. I don't think a mist can move traces of makeup unless you spray it on a cotton pad. I feel this would be wasting the VItal Unifier, so I use the mist as a hydrating essence instead of a "traditional" pH balancing/makeup removing toner. If you fancy reading more about my current cleansing and skincare routine, please check out this article. I haven't seen any major differences in my makeup if I've misted during the day, but the feel on my skin has been cooling and refreshing. I usually need only 2 pumps instead of the recommended 3-4. The Vital Unifier is in water and aloe base, enhanced with apple fruit water, hydrating hyaluronic acid and antioxidants such as chamomile, licorice root extract and white tea. These antioxidants are to protect the skin from oxidative stress and promote a plump skin. Pentylene Glycol is another moisturizer, the rest of the ingredients are safe viscosity controllers or emulsifiers. What rises concerns in me are the essential oils and fragrance listed at the bottom of the list. Personally I don't find the mist irritating nor very fragrant, but if you're sensitive to essential oils derived from citrus for example, I'd might skip this. I'm excited to try more from NUORI, I'm sort of obsessed with the brand. I could see the founder Jasmi is truly passionate and knowledgeable about skincare. The whole concept, package design, typography and innovation gets my head spinning as well. If you love face mist, I think NUORI's Vital Unifier is a good one to pick up. I don't find mists a necessity, but if you enjoy spritzing your face during the day the Vital Unifier is cleanly formulated, pleasure to use and above all - freshly made. I would use it to spray my face, neck and décolleté as an essence or a hydrating toner as it is perfect for layering - especially with a facial oil or an oil-based serum. I have dry skin and enjoy using any hydrating product and seal it in with an oil or a balm for extra supple, plump skin. I like the Vital Unifier's all-in-one idea, but I don't think this mist can change the look of your makeup during the day, only refresh how your skin feels. The ingredients list is quite short and sweet - this mist isn't going to fight your wrinkles, acne or pigmentation, but to give you a nice experience during the day with a hydration boost. I think all skin types can enjoy this mist, except very sensitive ones due to the fragrance/essential oils. Do you absolutely need it (or any face mist)? Perhaps not, but you'll certainly enjoy it. 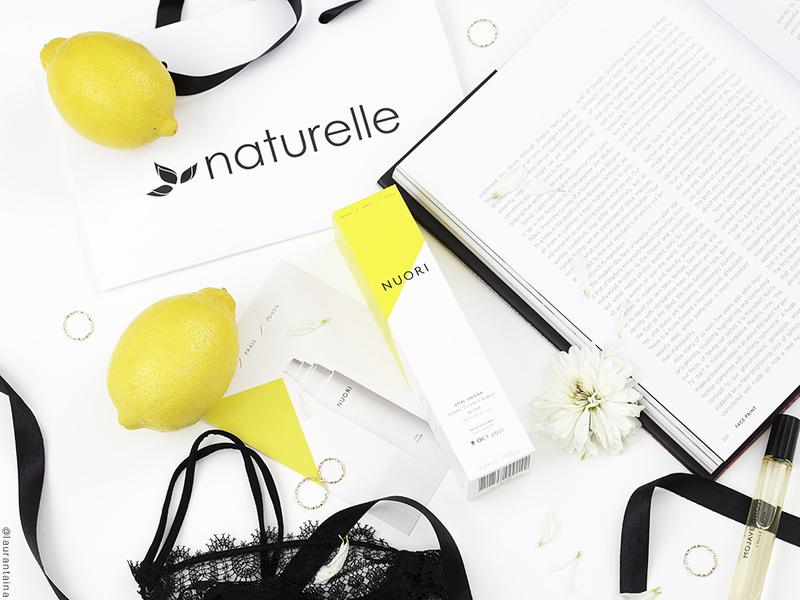 Check out NUORI's store page for their retailers (there's quite many), in Finland you can check 'em out at Naturelle in Bulevardi, Helsinki. Thank you to NUORI and the awesome staff at Naturelle for giving me this bottle for try and review! This product was generously provided for consideration. Regardless, my opinions are my own honest and unbiased views. The links are for your convenience and do not contain ads.